I imagine that chump will have to be spending millions on the sinsod. Fundamental flaw here, valentines day is a week away!? ... and immediately asked for a 500K gift back? Giving a Boquet of money definitely makes more practical sense than a bunch of flowers which would wither and die !!! Fundamental flaw in your reading, it was his birthday present also. Ah, that's what true love is - giving someone money. My lady presented me with my Valentine’s yesterday too. Two big blooms in a pot. Lovely surprise. She had spent all day quietly in her home office and I had been wondering what she was up to. Made them herself and then couldn’t wait until the 14th: too excited! Not 100,000 baht but I’m certainly not counting. 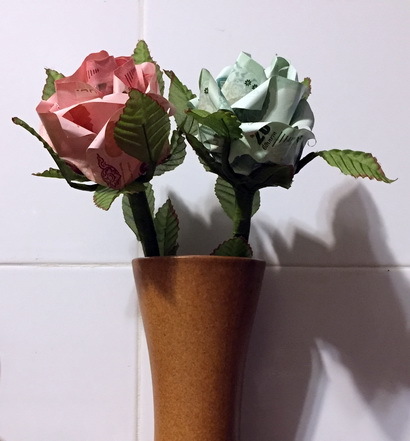 Anyone interested in this idea to surprise their gal, but who doesn’t have the time or skills, apparently there are florists who provide the service and even some online - you can send your money and have it made into flowers like this.